You’d think Mark Bittman would have already written everything he had to write on cooking. Prior to last month’s release of Dinner For Everyone: 100 Iconic Dishes Made 3 Easy Ways—Easy, Vegan, Or Perfect For Company, he’d published almost two dozen books, including smash hit How To Cook Everything, which has sold more than a million copies. He’s written about baking, grilling, vegan food, fish, dieting, and ethical eating. What was left to cover? As a fan of How To Cook Everything, I’m here to proclaim that Dinner For Everyone is even more of a must-have (a force-have? ), especially for cooks just getting started in their kitchens. 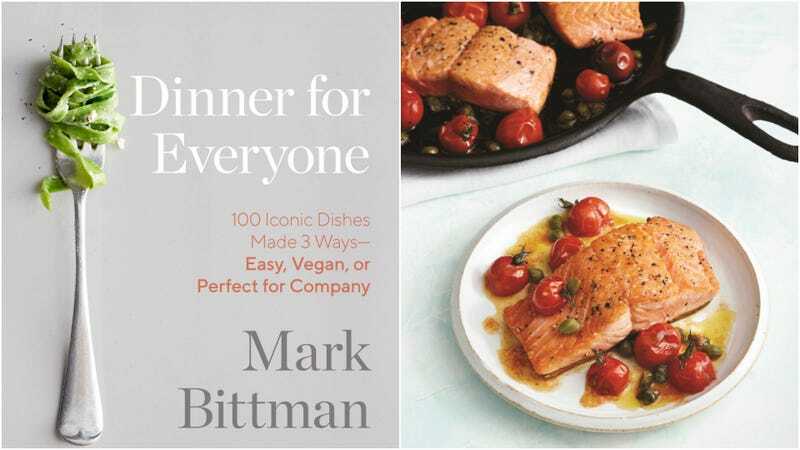 Its premise is simple and wildly utilitarian: For each of the 100 general dishes (from dumplings to seafood pasta to Korean barbecue), Bittman presents three versions—an easy recipe, a vegan recipe, and a more advanced, make-it-for-a-special-occasion recipe. Genius. After all, this is how most of us plan our meals, right? I’m in the mood for a stir-fry, but it has to be something I can throw together quickly. Or, I want to make a casserole, but I have two vegan friends coming over. Or, how can I make a truly spectacular bouillabaisse to impress my family? And in classic Bittman fashion, he imparts techniques along with the recipes. His easy Bolognese sauce recipe, for example, teaches you to build a Bolognese from whatever meat, leftover veggies, and herbs you have on hand. Having cooked it once, I feel confident I could recreate it with a different set of ingredients. Each of the recipes I tested were as-billed: the easy recipes were easy, the impressive recipes impressive. The former are appropriate for weeknight, mostly-under-30-minute meals, while the latter are the kind of weekend project you’d tackle for a holiday or special dinner party. The vegan recipes rely heavily on tofu, seitan, mushrooms, and beans, but what vegan recipes don’t? They might help some meat-eaters with their Meatless Monday efforts, trying a mushroom and kale stroganoff instead of beef, or a sweet potato and corn enchilada in place of chicken. I was gifted with How To Cook Everything when I moved into my first college apartment, the perfect time to learn how to make the basics. Dinner For Everyone would have been an even more practical guidebook, as it grows with the reader, from basics to advanced techniques. It’s a cookbook I’m sure will end up just as dog-eared, sauce-splashed, and well-loved as Bittman’s others. Put the barley in a large dry skillet over medium heat. Cook, shaking the pan often, until the barley is golden and fragrant, 3 to 5 minutes. Transfer to a bowl. Put the walnuts in the skillet and repeat the process to toast them the same way. Warm the stock or water in a medium saucepan. Put the olive oil in the skillet over medium heat. When it’s hot, add the onion and cook, stirring occasionally, until soft, 3 to 5 minutes. Add the barley and cook, stirring often, until it is glossy and coated with oil, 2 to 3 minutes. Sprinkle with salt and pepper, then add the white wine. Cook, scraping up any browned bits from the bottom of the pan, until the liquid bubbles away. Use a ladle to add the warm stock, one cup or so at a time, stirring after each addition. When the stock has just about evaporated, add another ladleful. The mixture should be neither soupy nor dry. Adjust the heat so the mixture bubbles and stir frequently. After 20 minutes, add the beets. Continue cooking the same way, tasting the grains regularly—you want it to be tender but still with a tiny bit of crunch—it could take as long as 40 minutes to reach this stage, depending on the barley. When the barley is as tender as you like, add the arugula or beet greens a handful at a time, stirring until each addition is wilted. Taste and adjust the seasoning. Garnish with the walnuts, and serve hot. Reprinted with permission from Dinner For Everyone. Copyright © 2019 by Mark Bittman. Published by Clarkson Potter, an imprint of Penguin Random House, LLC.